16. "Female Soldier at Training Camp": military installation in the Golan Heights. I made many photographs at this military site in the Golan: soldiers practicing how to take control of a Syrian bunker (based on an actual battle from the Six Day War); soldiers lounging with their compatriots during a pause in the action; tanks, flags, and shields of the "Lightning Brigade." But this lone female soldier, toting her gun just as easily as her purse, seemed singular to me. 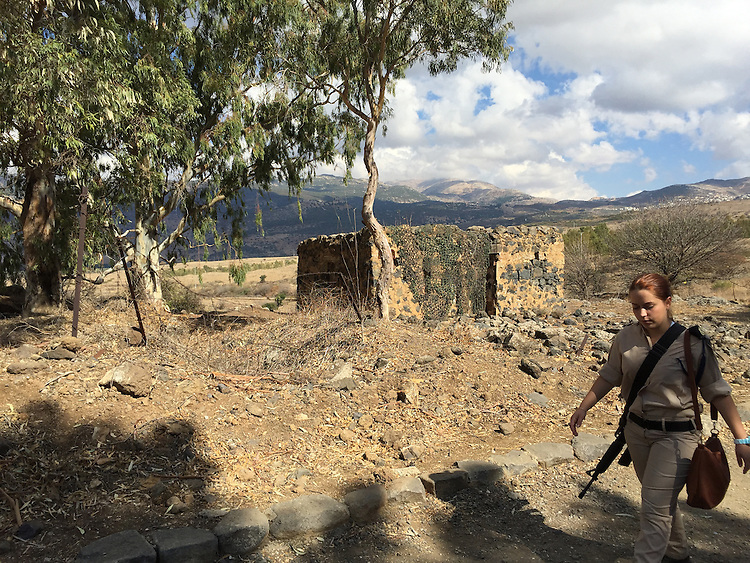 Lost in thought, looking young and innocent, she walks into the shadows of other soldiers as the Golan stretches behind her on this calm, autumn day.